On this episode of the DistressedPro Professionals Podcast our own Brecht Palombo and the legendary Tracy Z dive into a new niche in the note business, and how investors can use it to make sizable gains quickly. Tracy has handled millions of dollars in real estate note deals and alternative cash flow purchases since 1988. She has years of insider secrets, with real life examples that can help you realize profits today, and build cash flow for the future. She was the 2014 Note Expo Convention speaker. Tracy Z specializes in seller financed notes. Often a seller owns a piece of property, and instead of requiring the buyer to seek a loan, they allow the buyer to make payments over time. So, there’s a promissory note created, and depending on the state, this is usually secured by a deed of trust or a mortgage. See Five Ways to Find Cash Flow Notes. Did you know that about six percent of real estate transactions have some form of seller financing? That’s a sizable segment of the market. Over 300,000 private mortgage notes created in a good year. As an expert, Tracy shares How to Calculate Cash Flow Notes. In Tracy’s experience, seller financed borrowers are generally performing. There are a variety of reasons that both sellers and qualified borrowers choose the private note and mortgage financing route. As many of the largest and best funded note buyers focus on institutionally created mortgage notes, and non-performing notes, there can be even more room sourcing great private mortgage note deals for newer and small to mid-sized players. Plus, there are even business notes to explore in this space too. And the profits can be very attractive. 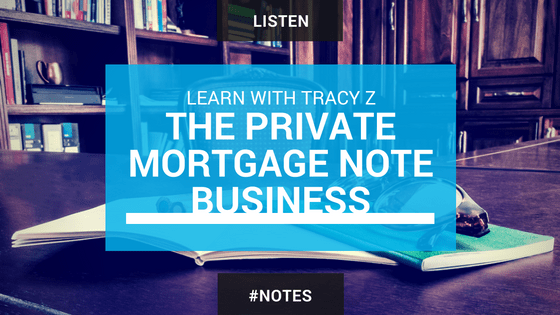 Click here to see Tracy Z’s tips on Finding Cash Flow Notes. Unfortunately, I have only just now listened to this informative podcast. I have printed it out, however, I do not see any information about Tracy Z’s own information or website. She did say she was offering some free mini information. Where would that be? Do you not see links to her sites above?